Want an effective marketing solution for your brand and products? 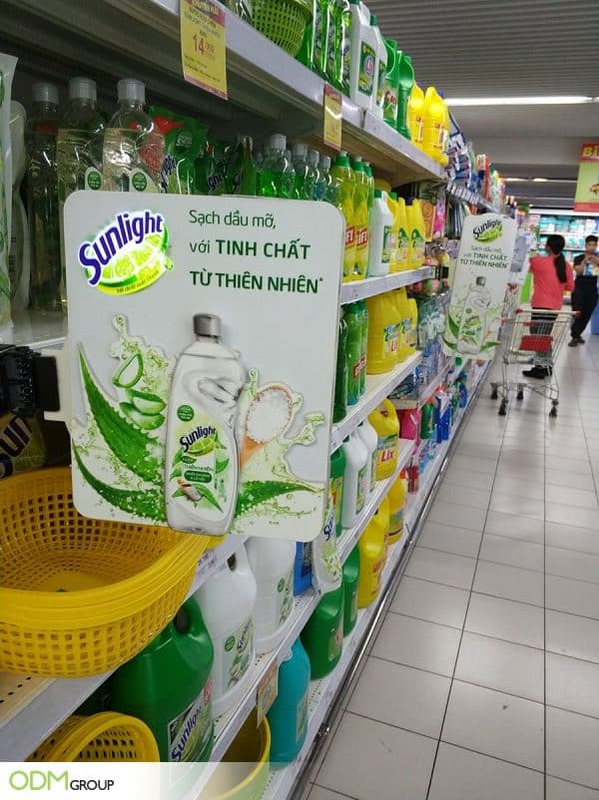 Learn from the promotional shelf talkers by Sunlight Vietnam. The shelf talkers can easily grab customers’ attention and intrigue the crowd like no other. 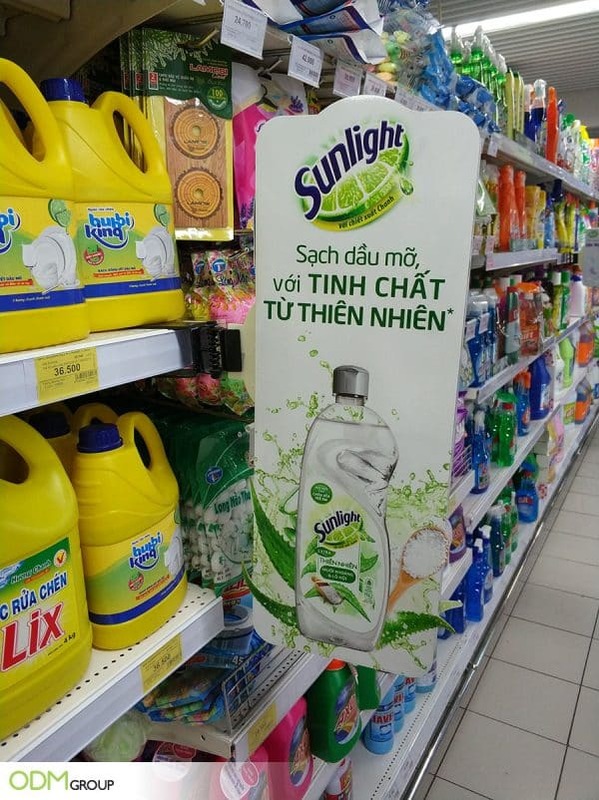 From the first look, shoppers can immediately notice the Sunlight logo and its dish washing liquid. This helps the product, located in a fully-packed gondola shelf, to stand out and grab customers’ attention. In essence, the shelf talker is an especially good way to enhance brand awareness for Sunlight. Why the Sunlight’s promotional shelf talkers are impressive? Visual representation: this promotional shelf talkers are basically 3D design of the actual product. Besides, there are lights in some parts (inside the bottle and the Sunlight logo) to further emphasize the brand and its primary product. Simplicity: look at the handle of the shelf talker. We can see that with this design, marketers can easily attach the signage to the rack. Convenience: Because of the handle, it’s simple for store and supermarkets to assemble the shelf talker. Furthermore, retailers can even choose where they want to put the shelf talkers on display and move it around if necessary. How can the promotional shelf talker benefit Sunlight? Brand Visibility Enhancement: 3D promotional shelf talkers with moving lights. Without doubt, customers’ eyes will be drawn to the POS displays. Just with this, the brand has successfully made initial contact with buyers. Sales Boost: the promotional shelf talkers will definitely attract potential buyers to Sunlight logo. As a result, Sunlight will be on customers’ minds. People will be more likely to buy the dish washing liquid and Sunlight’s sales will increase. Want custom products like this promotional shelf talkers? Custom POS displays are must-haves for any marketing campaigns, so are shelf talkers. If you are interested in POS, free gift with purchase, or any other types of promotional merchandise, feel free to contact us. With 15 years of experience and 8000 case studies on our blog, we have the expertise and the team to assist your marketing campaigns. 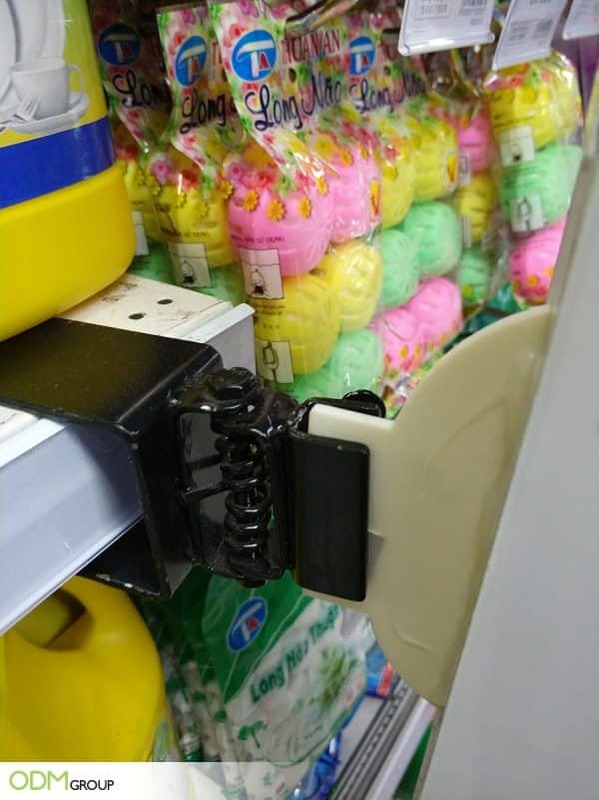 Low-budget yet effective custom POS displays that every store and supermarket uses. Brit London’s shelf talker is a simple, attractive design. Surely Brit London can stand out from other brands in a huge department store with this retail display. Also, if you want something more creative and unique like Sunlight’s promotional shelf talkers, you need to click on the below blogs. They are till POS displays, but we love how creative and appealing the designs are. POS Shelf Hanger Boosts Maggie Magic Sarap Sales, You Need It Too!